·Biparietal diameter (BPD) and Head Circumference (HC) correlates with the gestational age and other fetal measures. 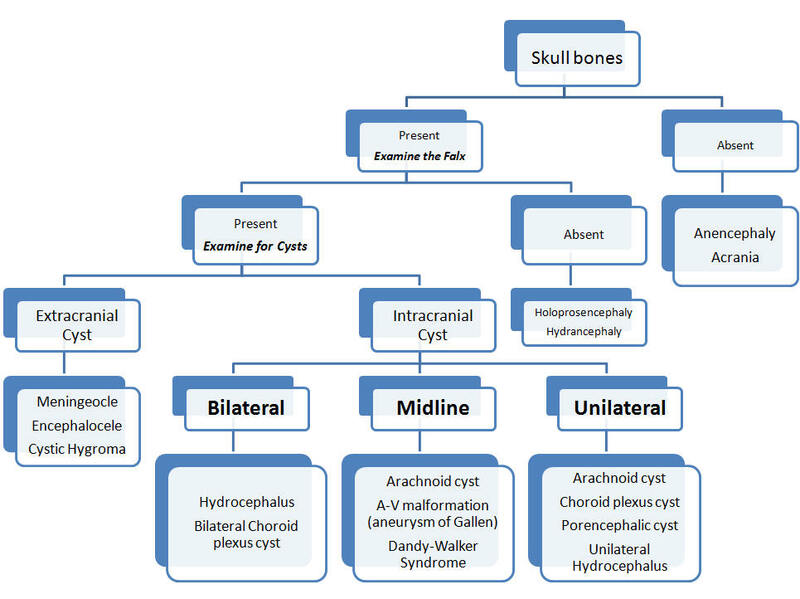 The above 2 points exclude most skull anomalies and hydrocephalus. - Line of falx cerebri is seen and not shifted to one side and structures on both sides of the falx are similar almost mirror image this excludes many brain anomalies. ·Trans-ventricular view which is just above the transthalamic view the lateral cerebral ventricles are visualized with the echogenic choroid plexus seen filling the bodies of the lateral ventricles, as gestation progresses from 18 to 24 weeks the ventricles and choroid plexus appear less pronounced with the growth of the cerebral hemispheres. 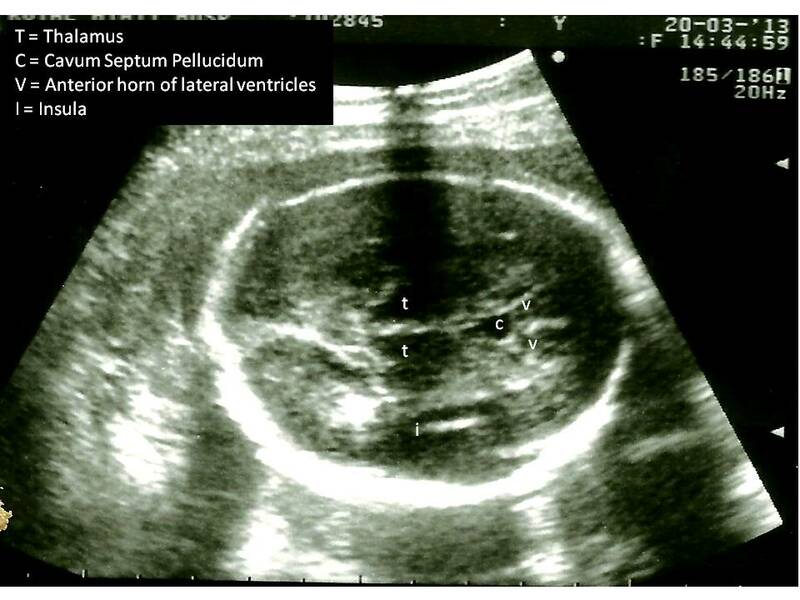 Measurement of the cerebral ventricle in an axial plane should not exceed 8mm before 25 weeks gestation. ·Trans-thalamic view try to document visualization of the thalami (1) and between them is the third ventricle (2) and anteriorly a midline fluid filled cavity (larger than the third ventricle) is the cavum septum pellucidum (3) lying between the anterior horns of the lateral ventricle (4). The BPD is taken at this level. ·Transcerebellar view is below the transthalamic view and is obtained when the cerebellum and cisterna magna are visualized. At this plane the cerebellum, cisterna magna (anteroposterior diameter from vermis to inner aspect of occipital bone should not exceed 10mm) and nuchal fold (should not exceed 6mm) are evaluated. ·Facial structures are revised orbit, nose and upper lip, with special attention to upper lip view to exclude hare lip. It is important to appreciate that the DD of lesions is extremely difficult and thus it is better to decribe a lesion as detailed as you can rather than suggest a definite diagnosis. 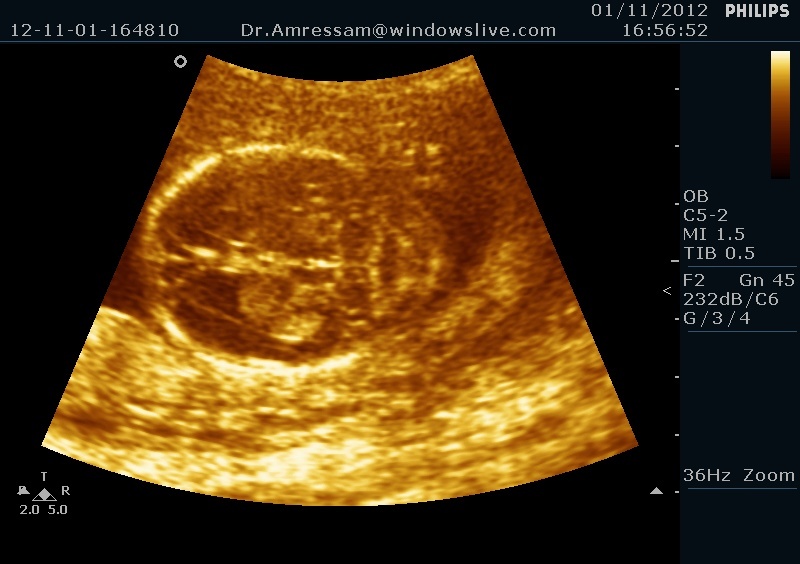 The resolution of the ultrasound is extremely important to be able to view these structures. - Not routine but in the midsagittal view sometimes the fetus swallows, during swallowing movement you will be able to trace the tongue movement just assure that the tongue during swallowing never touches the posterior pharynx, because if the back of the tongue reaches the posterior pharynx this fetus has absent or cleft palate. 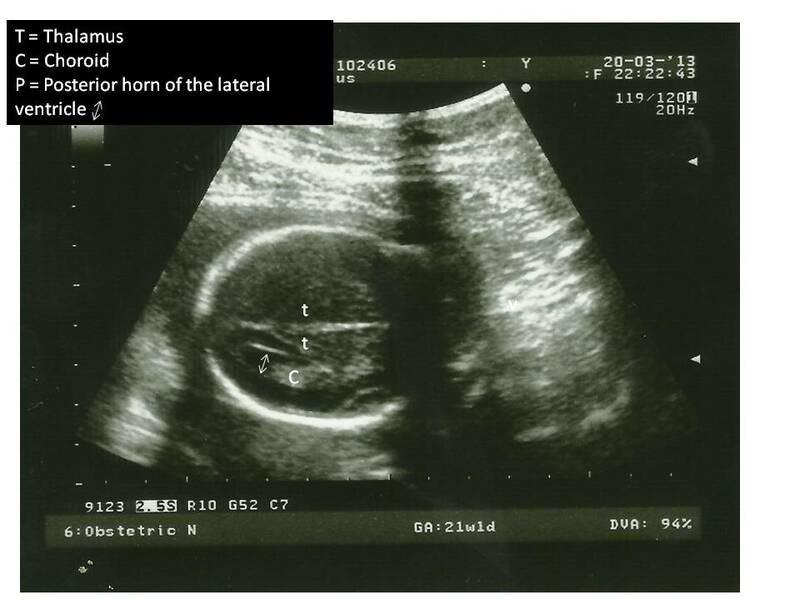 * Choroid plexus cyst: cystic like space seen in the choroid plexus due to entrapment of CSF in neuroepithelial fold, mostly detected during second trimester and would resolve by the third trimester without consequences. However, 10% of feti with trisomy 18 show Choroid plexus cyst (s). 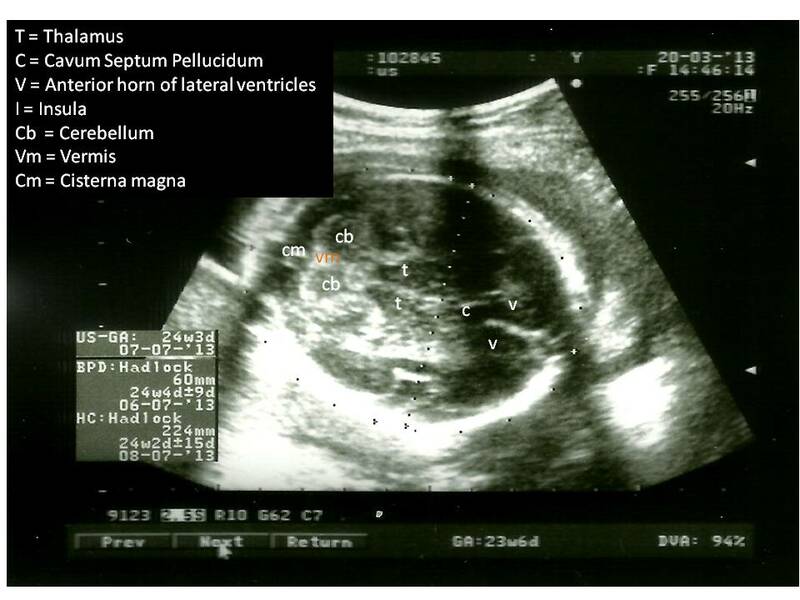 * Mega cisterna Magna: This term describes an enlarged cisterna magna (>10mm) but with intact vermis, absence of hydrocephalus and normal fourth ventricle, it is considered a normal variation. 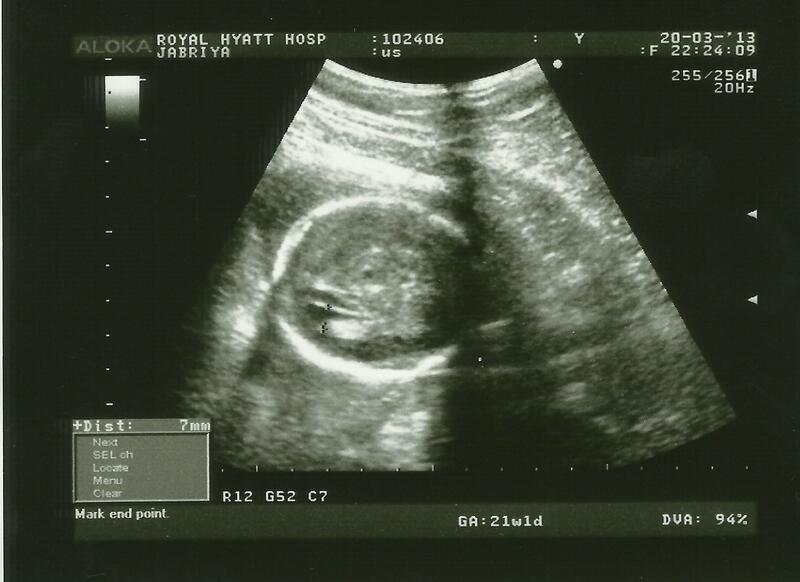 *Cavum Veil Interpositi: Small midline intrhemispheric cystic dialtation (<10mm) commonly seen in second trimester scans. It is considered a normal variation and has no genetic association. 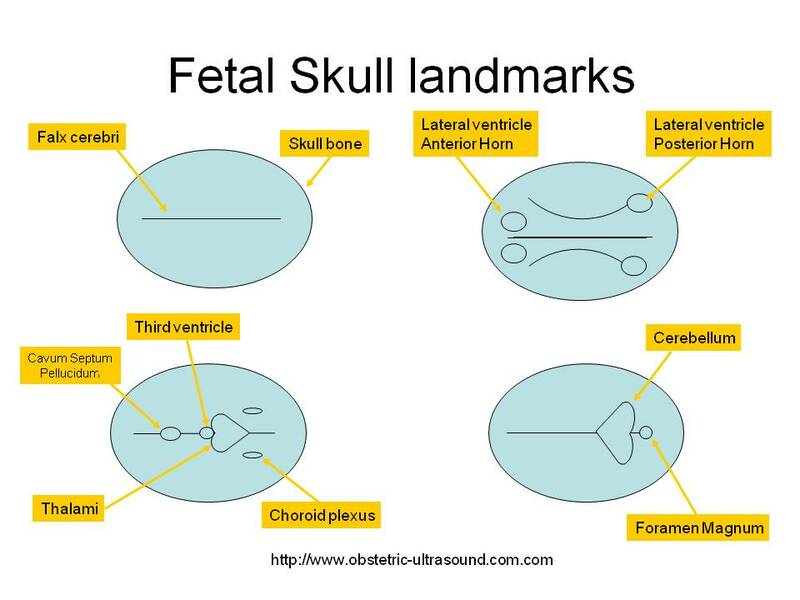 *Hydrocephalus:: Enlarged ventricles leading to fetal head enlargement (BPD and HC) for the gestational age. *Cephalocele: Herniation of intracranial structures through a defect in the cranium. *Holoprosencephaly: Group of defective formation of the forebrain due to incomplete devision of the cerebral hemispheres. It is classified to 4 types (Alobar, Semilobar, Lobar and Midline interhemispheric) all characteriseed by different degrees of absence of falx cerebri division of the cerebral hemispheres. *Dandy Walker malformation: Cystic enlargment of the fourth ventricle with partial or complete agenesis of the cerebellar vemis. *Absent Vermis: Cerbellar vermis absence will appear as a cleft separating the inferior part of the cerebellar hemispheres. 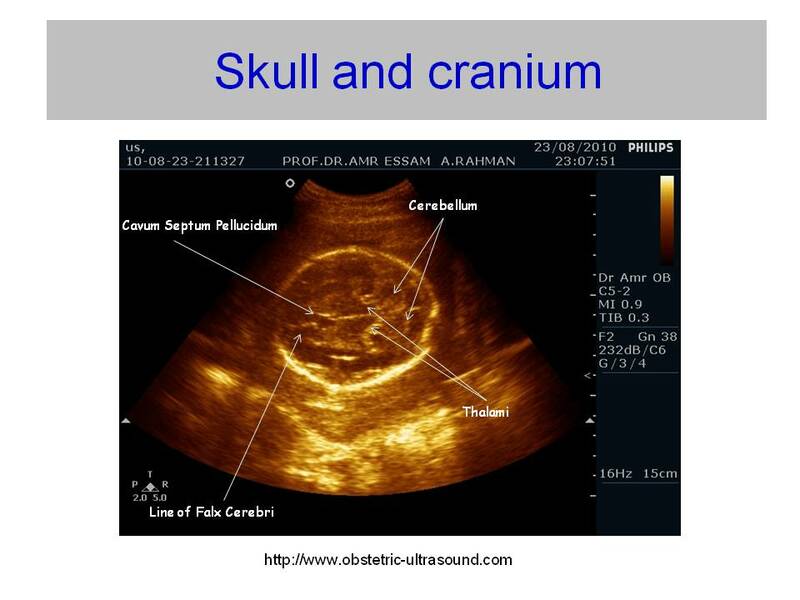 *Chiari malformation: Involves 4 types of displacement of the cerebellum into the foramen magnum different signs are mentioned (Lemon shape of the occipital bone, Banana shape of the cerebellum) . *Macrocephaly: Head Larger than 98th percentile without cranial anomalies. *Hemimegalencephaly: Assymetry of the cerebral hemispheres with shift of the midline and dialtation of the lateral ventricle on the affected side. *Lissencephaly: Smooth cortex with no sulci and gyri due to abnormal neuronal migration. *Schizencephaly: CSF filled clefts of the cerebral hemispheres extending from the subarachnoid space to the lateral ventricle splitting the brain. *Hydranencephaly: Replacement of the normal brain tissue with a large fluid collection covered by leptomeninges and dura, the falx cerebri is still seen..
*Porencephaly: Fluid filled area that results in destruction of previously formed brain tissue with subsequent cavitary formation. It commonly communicates with the ventricles, subarachnoid spance or both.